Ratifia Cakes 2 oz of sweet almonds, 1 oz of bitter almonds, 4 oz of powdered loaf sugar, mix it very stiff with the white of Egg well beaten, bake them on Tins. Mrs. Howe Jinnrs receipt. February 23rd. 1856. A plain Soda Cake 1 1/4 lb of Flour, 1/4 lb powdered loaf sugar, 1/2 lb of Currants, 1 Egg, 1 tea-spoonful of carbonate of Soda, 3 oz of butter, a little candid peel, bake it directly. Mrs. Howe Jinnrs. receipt February 23rs. 1856. 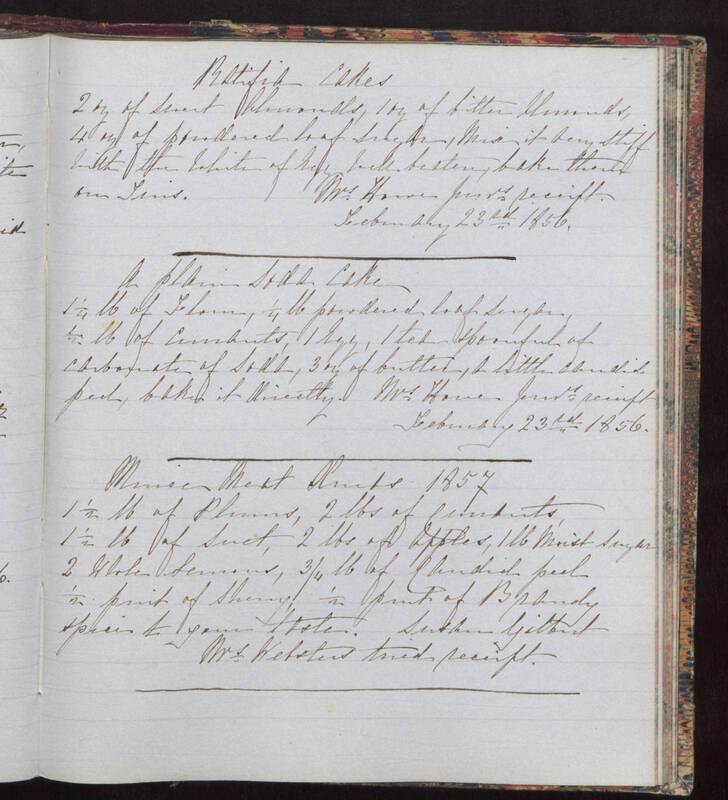 Mince Meat Xmas 1857 1 1/2 lb of Plums, 2 lbs of Currants, 1 1/2 lb of Suet, 2 lbs of apples, 1 lb Moist sugar 2 Whole lemons, 3/4 lb of Candid peel 1/2 pint of Sherry, 1/2 pint of Brandy spice to your taste. Susan Gilbert Mrs. Websters tried receipt.